The year is coming to a close and we are looking forward to 2018. In case you missed out, here’s a recap of the fun Member events we had during the previous months. 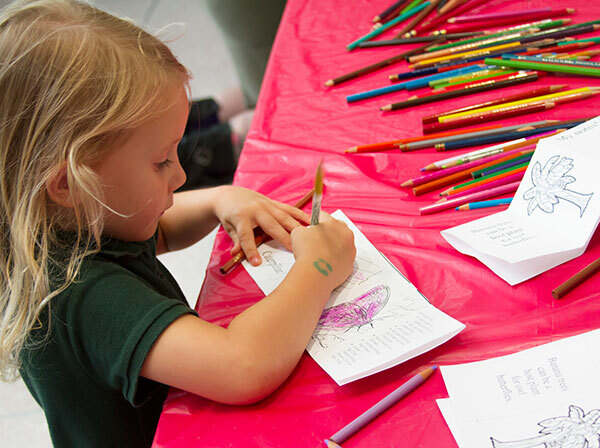 Stay up to date with HMNS by subscribing to our weekly Member newsletter and following us on Facebook and Instagram. 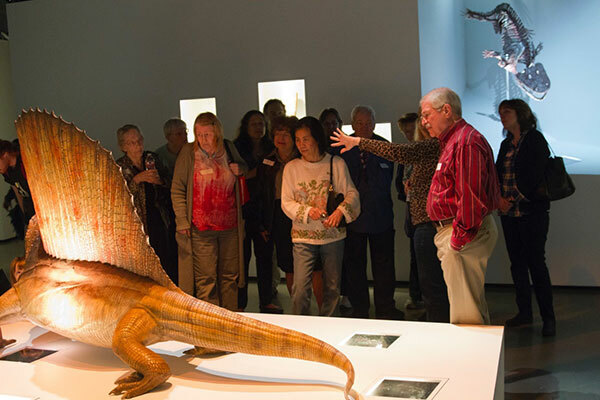 This year we introduced a new quarterly event for our HMNS senior Members, the Senior Social. 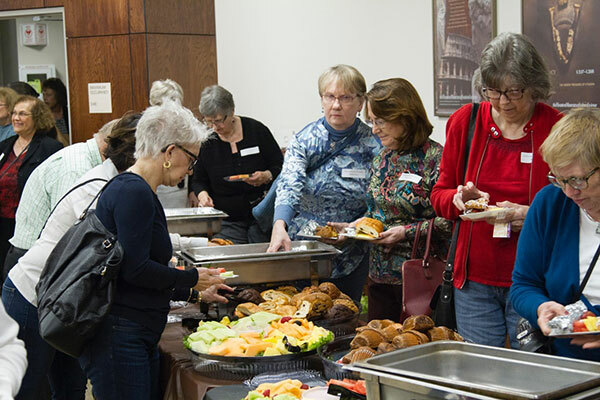 We hosted a delicious breakfast for Members and they were able to socialize with other Members as well as enjoy exclusive tours of Museum exhibits. The next Senior Social will be in February with tours of the newly reopened Wiess Energy Hall. Mark your calendars! 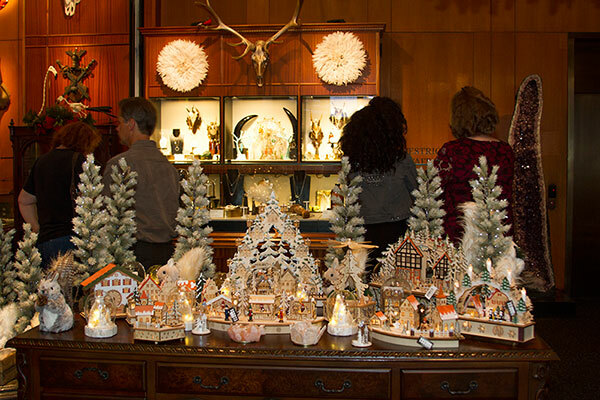 This holiday season we introduced our first-ever Sip and Shop event. Members and their guests took advantage of a bonus discount and browsed our gift shop to get their holiday shopping out of the way. It was a fun evening of crafting and shopping! Look forward to our next Sip and Shop, coming up this spring. Back by popular demand! 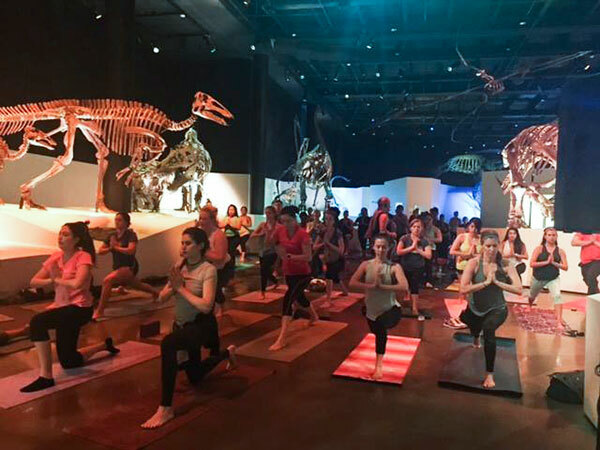 Since it was such a big hit the first time, we decided to bring you another night of yoga with the dinosaurs. We even had one of our HMNS Catalysts Steering Committee Members take part in an Instagram take over and share the event with our HMNS followers. We hope you can join us next time! Passports in hand, Members were excited to travel with World Trekkers to Canada. We decided to change it up a bit and had a dress up corner where kids were able to strike a pose in a Mounty jacket or as members of a Canadian hockey team. We also had a variety of different crafts, including paper horse puppets, foam whales, and a chalk scenery of the northern lights. Our special guest, Bonnie Blue, helped document this fun event with her artsy rocks. Get your passports ready for the New Year and future World Trekker destinations! The newly energized Wiess Energy Hall was unveiled to Members during two nights of special, private viewings that were closed to the public. 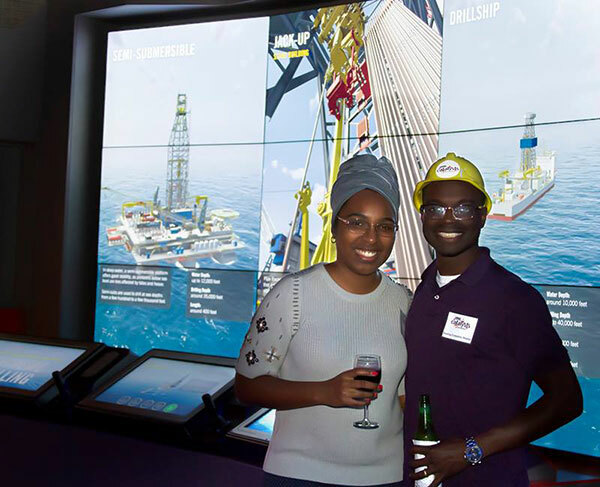 Members were greeted by a moving drill bit as they stepped off the elevators to the 4th floor – an exciting entrance that is paired with a digital backdrop of an ocean horizon transitioning from day to night. 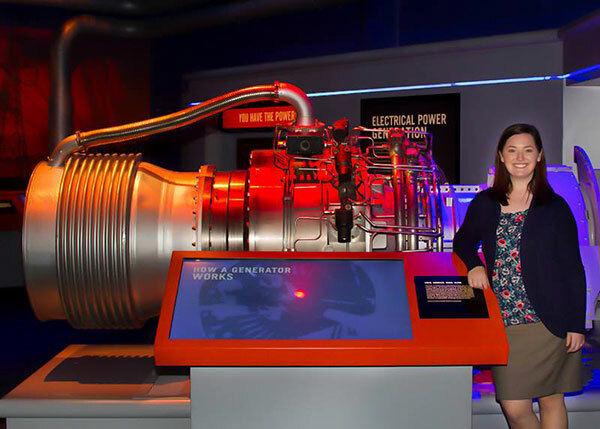 This new exhibit offers a more interactive way to experience and learn about energy. We continued introducing the newly updated Wiess Energy Hall with an event for our Young Professionals, the HMNS Catalysts. A favorite part among visitors was Energy City: “a 3D landscape representing Houston, the surrounding Gulf Coastal waters and the terrain of southeast and central Texas.” Featuring 30 minutes of custom animated content, it tied the exhibit together and allowed Members a moment to gaze upon the ever-changing Houston skyline. As a special guest, we invited back the rock artist, Bonnie Blue, who painted caricatures of Members and their guests on river rocks. Want to join HMNS Catalysts? Click HERE for more information on how to become a Member. This year went by in a blink and we hope you enjoyed this year’s lineup of events. We look forward to 2018 and are excited to bring you another year of membership fun. Follow us on Facebook, and Instagram to stay up to date and make sure you’re subscribed to our Member weekly newsletters. Previous Post What was the Christmas Star?